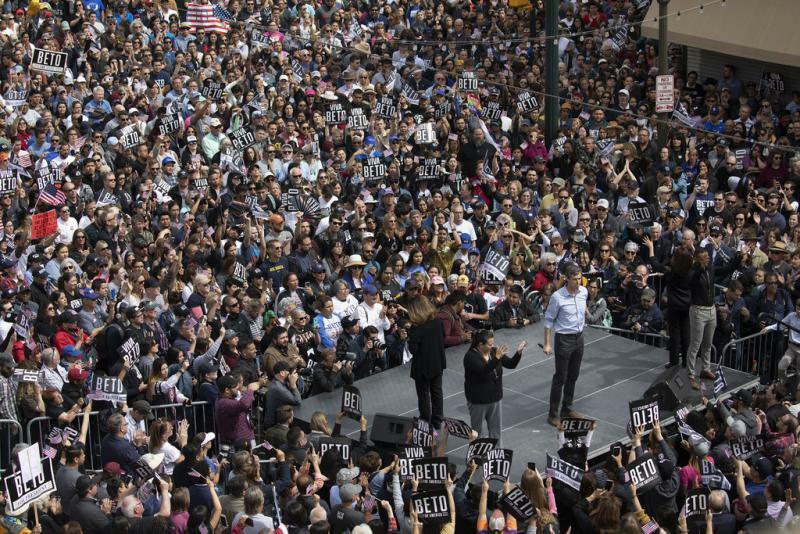 Beto O'Rourke addesses the crowd at his campaign kickoff rally in El Paso on Saturday. 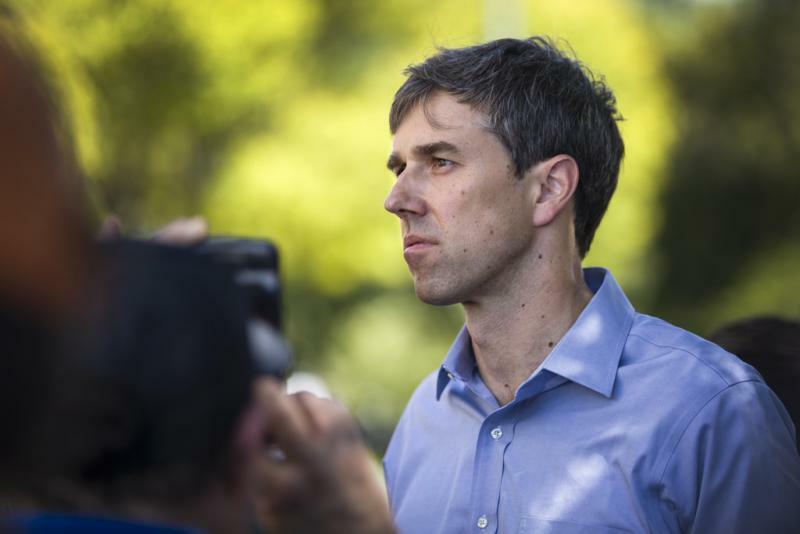 O’Rourke made immigration a key part of his campaign – and offered his hometown as an alternative vision for what immigration should look like in the U.S.
El Paso’s border with Mexico already had been the focus of national attention. In the days leading up to the rally, federal immigration officials said they were running out of resources to handle the influx of migrants, so they were barricading people under a bridge. As a result, families were forced to live and sleep outside for several days as the government figured out what to do. David Casillas, a disabled veteran living in El Paso, said he and his wife saw the pictures on TV and noticed there were a lot of children. Casillas brought some extra baby food, clothing and blankets over to where Customs and Border Protection were keeping the families, but he was turned away. Instead, he would have to find a charity to donate the items to. Casillas said the situation has been frustrating and he thinks the U.S. could do more to help people seeking help. “Maybe we need to take a really good look at what we are doing and how we are doing it,” he said. Immigration and the situation at the border were on the minds of a lot of people at O’Rourke’s rally. Susana Garcia, who lives in El Paso, said she’s concerned about the way the country is treating immigrants. Garcia pointed to El Paso as an example of that; she said immigrants work hard and have created a thriving community. Rene Marquez, who also lives in El Paso, said immigrants are a big and important part of the city. In fact, he said, he thinks they are why El Paso is a nice place to live. Marquez said that's one reason he’s excited someone from El Paso is running for president. 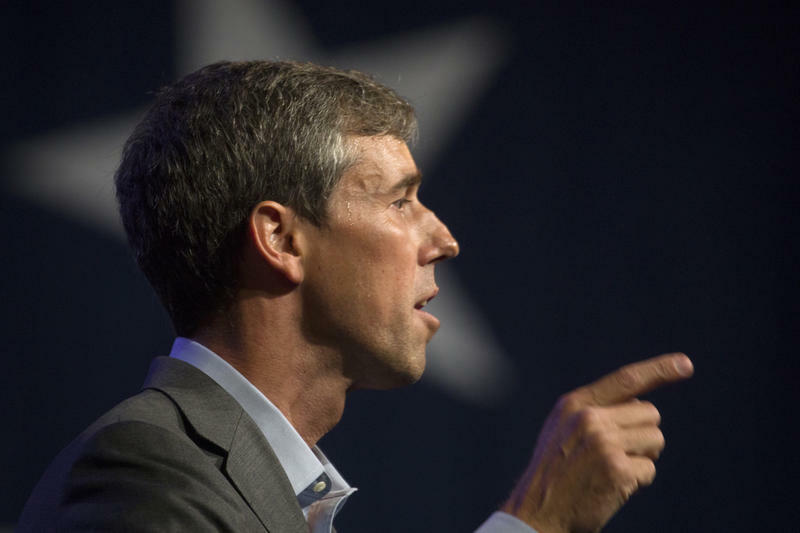 He said O’Rourke’s campaign is in a unique position to present an alternative vision of what life is like on the U.S.-Mexico border. 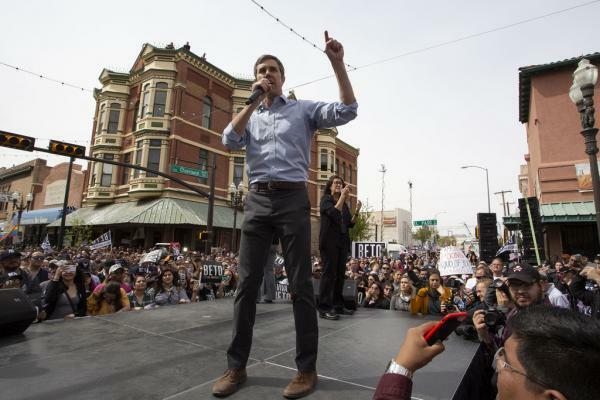 While President Trump portrays cities like El Paso as dangerous places, he said, O’Rourke’s campaign can make a different case. If elected, O’Rourke said, he would work to reunite families separated at the border by the Trump administration. He also pledged to help more people who were brought to the U.S. illegally as children –known as Dreamers – to get legal status. And he said he wants the U.S. to go back to honoring existing asylum laws. Katherine Jackson said she has mixed feelings about immigration, but she mostly agrees with O’Rourke. Jackson said she didn’t always feel this way. She grew up in a conservative community in South Carolina and moved to El Paso only a few years ago. Jackson said living in a community where immigrants are respected made a huge difference in how she sees the world. Now that a presidential candidate is running a campaign out of El Paso, she said, she hopes more people will change their views, too. Democratic presidential candidate Beto O'Rourke declared that immigrants make the country safer as he staged rallies across Texas to formally kick off his 2020 White House bid. Beto O’Rourke has begun the long process of introducing himself to potential voters in Iowa. The former congressman from El Paso, who officially announced his bid for the Democratic presidential nomination Thursday, made several stops throughout the state over the past few days. Candidates often give Iowa special attention because it's the first state in the nation to hold a presidential-nominating contest. Democrats who've been competing longer than Beto O'Rourke are taking offense at the former Texas congressman's sense of entitlement.